If there was ever a collection that summed up the ever-revolving cycle of fashion, it was the one shown by Matthew Williamson at London Fashion Week, as he celebrated 15 successful years at the helm of his own-name label. Williamson aim was to make a synopsis of “the DNA of the brand”- peacock bright colour ways and daring, red carpet ready evening gowns being eponymous with the label- and perform a thorough re-evaluation for the modern customer. The traditional Williamson clashing hot ‘n’ cold colour palette was reimagined onto thoroughly modern silhouettes, proving that the designer has a lot more depth than singularly providing red carpet magic. 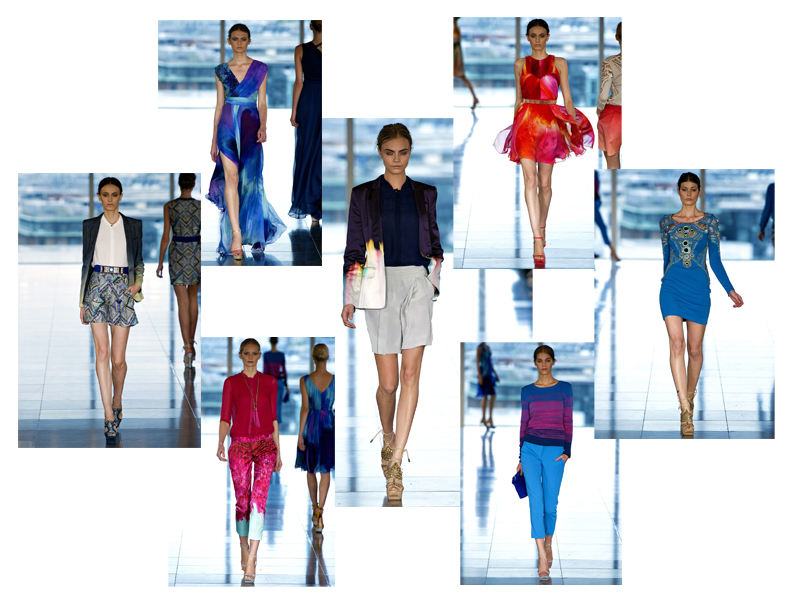 Blazing trails of peacock brights blistered and collided in a stream of white light on of-the-moment silken shirts and short suits. Ankle grazing tailored trousers and lust-worthy knits added to the wearable aspects of Williamson’s S/S ’13 collection; no longer will these designs simply clothe the pages of the glossies, but the backs of their exacting editors as well. Kaleidoscope prints adorned more trousers, dresses and jackets; the design was abstracted using embellishment and laser cut-outs, indicating Williamson’s progress and experimentation over the years. Finally, flowing, bias-cut dresses in shades from aquamarine and cobalt to the fieriest of sunset orange/pink gave the designer his grand, A-list ending. This was a style revision that followed in the footsteps of Galliano for Dior: Williamson chose a few precise elements of his brand’s makeup, selecting only those details which were both eponymous to the label’s image and which could easily translate into covetable modern designs, as John Galliano accomplished with the iconic New Look silhouette at Dior. We can only hope that Raf Simons will also perform such a successful transition in his first ever ready-to-wear collection for the label at Paris Fashion Week; he would do well to take some advice from Williamson on that one.